Integrated Solid waste management (ISWM) is an integral part of the urban environment and planning of the urban infrastructure to ensure sustainable and eco-friendly living environment while considering the promotion of socioeconomic development. Rapid urbanization, urban growth and economic development of the developing countries in the Asia Pacific region has caused numerous problems of waste disposal. It is further aggravated by the lack of technical capacity, particularly in human resources trained in ISWM practices in the areas of waste collection, transportation, processing, technology and disposal. An integrated solid waste management system is strongly connected to three dimensions: urban environmental health, the city planning/growth and resource management. According to the Sustainable Development Goals (SDGs) framework, SDG Target 6.3 states “By 2030, improve water quality by reducing pollution, eliminating dumping and minimizing release of hazardous chemicals and materials, halving the proportion of untreated wastewater and substantially increasing recycling and safe reuse globally” Also, target 12.4 says “By 2020, achieve the environmentally sound management of chemicals and all wastes throughout their life cycle, in accordance with agreed international frameworks, and significantly reduce their release to air, water and soil in order to minimize their adverse impacts on human health and the environment” Lastly, target 12.5 emphasizes “By 2030, substantially reduce waste generation through prevention, reduction, recycling and reuse”. Sustainable Development Goal 12 (Responsible Consumption and Production) focuses on lifecycle approach to reduce the waste and its impact on environment while supporting quality of life. In this regards, this capacity building workshop will provide participants with opportunity to obtain a better understanding of waste management practices, policies, and programs by cities and national governments to deal with waste problems in their own countries. The workshop is intended to be interactive, thus participants are highly encouraged to share their own experiences, challenges, and opportunities for collaboration. CIFAL Jeju will facilitate these discussions, and hope to support the forging of new partnerships between participants. This overall goal of the course is to improve waste management practices, policies, and programs by cities and national governments that ultimately contribute to Greenhouse Gas (GHG) emission reduction at global level as well as to enhance the understanding of the application of ISWM at local level. 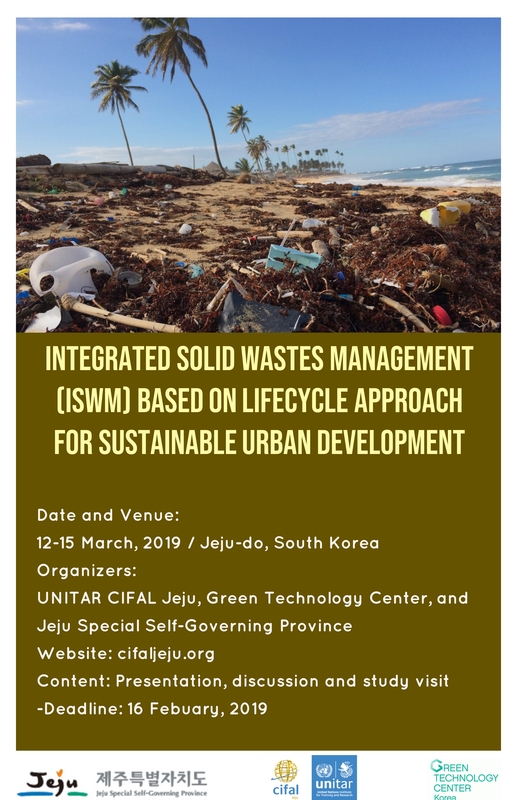 Participants will learn about: innovations in waste management appropriate for the Asia Pacific region; and Korea’s wastes management strategies and policies. - Select appropriate wastes management approaches to establish a policy master plan. This workshop is open to those in central and local government, non-profit and academic sectors in the Asia-Pacific region who wish to implement integrated solid wastes management (ISWM) policies and technologies in both urban and rural settings, or make their contribution to reducing wastes and GHG. - submit necessary documents on time, i.e., registration form etc. - complete and submit pre-training readings and assignments, i.e. case studies, self-assessment, etc. - participate actively in the training program and be fluent in written and spoken English.